Following is a Q&A with Mike Furutani, the weekend sports anchor for KSBW (serving Monterey/Salinas/Santa Cruz), who is an interpreter for the Oakland Athletics and is currently at Spring Training in Arizona. I am currently the Oakland Athletics’ interpreter for Hideki Okajima, who is coming back from a successful season in Japan as a reliever for the Fukuoka SoftBank Hawks of the Nippon Professional League. Okajima previously pitched for the Boston Red Sox from 2007-2011, where he won a World Series in 2007. He was also an All-Star in 2007. In 2012, he was signed to a minor league contract by the New York Yankees but failed his physical before Spring Training (according to the Yankees) due to shoulder damage. No other U.S. baseball teams would even give Hideki a tryout after the Yankees doctors declared him unable to pitch. Hideki returned to Japan, where he posted 0.94 ERA in 56 games with 36 strikeouts in 47 2/3 IP. He returned to the U.S. determined to get another chance to pitch in the Major Leagues and to become the first Japanese-born player to play in Japan, then the U.S., then back to Japan and then back again to the U.S. I interpret for Okajima when he speaks to the U.S. media (obviously I’m not needed when he talks to the Japanese media), his coaches, teammates, trainers and fans. This season (2013) MLB has authorized translators to go on the field during games when needed to translate during conferences on the mound. I hang out in the bullpen (since Okajima is a reliever) and then the dugout when he is in the game. I’ve been with him throughout Spring Training here in Phoenix and will accompany him when he goes to either Oakland or Sacramento (AAA River Cats). I also translate for Hideki off the field when he goes to out to eat or any other place that requires English. 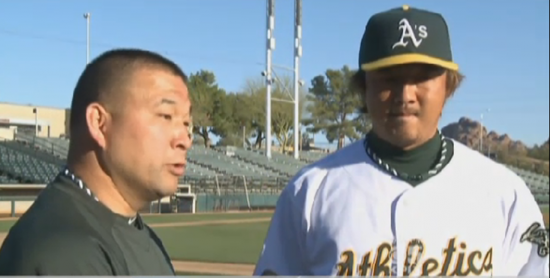 There is another Japanese player on the A’s roster — SS Hiroyuki Nakajima. He has his own translator, Hiroo Nishii (from Boston). Hiroo has to be with Nakajima 24/7 since this is Nakajima’s first time playing and living in the U.S. Luckily, Okajima has been in the U.S. before and he’s not that culture shocked, so I don’t have to be with him constantly when we’re not at the ballpark. Mike Furutani with Hideki Okajima. I was an emergency translator for the A’s back in 2005 for Keiichi Yabu, another Japanese pitcher. That was for only a week while the A’s found a replacement translator after they fired the original one. I guess I did a good enough job to leave a good impression on the Assistant GM David Forst. He called me in January to see if I knew anyone who could translate for Okajima this season. I asked him if I was ineligible and he replied that he thought I was too busy with my real work at KSBW. I told him that for this once-in-a-lifetime opportunity, I would be able to take some time off from broadcasting and help the A’s out. I have to admit, it’s been pretty cool. I now have an even deeper appreciation of the work that all the players, coaches and trainers put in to make a baseball team function successfully. Most fans only see the finished product when they go to a game and watch games in the regular season, but the preparation before the games is amazing (and tiring!). So far, I’ve been around for 25 Spring Training games (plus two weeks of practice before when pitchers and catchers reported) and I am exhausted — and there’s been no travel. I can’t imagine how tired I’ll be after a 162-game regular season! All the players, coaches, trainers and media have been really good to me and it is definitely an experience I will not forget. Too many “lost in translation” comedic conversations I’ve had with Okajima — including translating his eye chart test. Being recognized by a Bay Area family out of the blue as Hideki Okajima’s translator at a Phoenix restaurant. KPIX Channel 5 in San Francisco did a story on me and it aired on March 12 (it’s on the KPIX website and on my Facebook page), and two kids wanted to shake my hand and I had no idea who they were or how they knew who I was. Also turning down requests for autographs from fans who have no idea who I am is pretty funny. Susan Slusser (San Francisco Chronicle sports writer) also recognized me as the KSBW weekend sports anchor — she grew up in Pebble Beach. 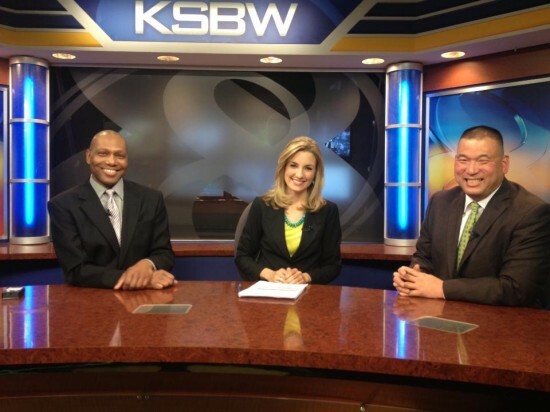 Mike Furutani (sports) is part of the KSBW news team with Brittany Nielsen and Arthur Jarrett. 3. Paintballing with some of the A’s players — how can this not be fun? 2. Going to the Owner’s Reception Dinner — ate dinner with Billy Beane and Lew Wolff (by accident — I didn’t say a word). 1. 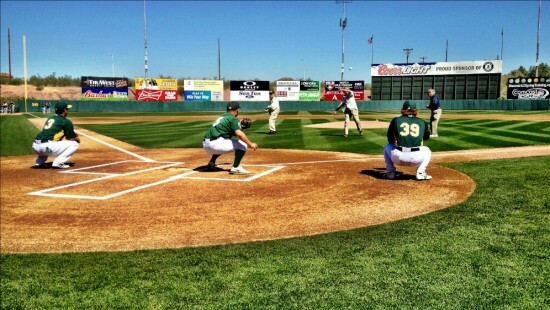 One of the best days of my life — very humbled to be part of the first pitch ceremony honoring the 70th anniversary of Kenichi Zenimura Field (@ Gila Relocation Center) and Japanese American baseball pioneers Masao Iriyama (SS), Tets Furukawa (P), and Kenzo Zenimura (2B) at the Oakland A’s-Seattle Mariners Spring Training game on March 7. Hiroyuki Nakajima (#3) and Hideki Okajima (#39) took part in the ceremony as well. Without these pioneers, there would be no Japanese American baseball leagues on the mainland. Through the difficulties and injustices of the internment of Japanese Americans during World War II, these players were able to play the game they love and provide an escape for the other internees and pretend that they still had normal lives within the barbed-wire fences. I give my heartfelt thanks and appreciation to all the Japanese American players that came before me. With the Nisei Baseball Research Project at Phoenix Municipal Stadium, I was able to wear my Lodi JACL baseball uniform to represent the NorCal Japanese American Baseball League. And who knows what else is in store?